Best performance when used in conjunction with upper and lower side links. aluminum pillow collar version available separately. 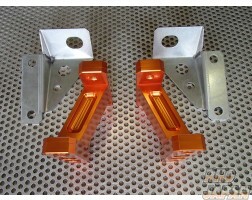 These items are a direct replacement for the factory rear arms. Superior materials and improved design provide a much more reliable and durable setup. Extended length provides ability for wide control of camber settings. Top quality NMB Pillow ball bushings provide extreme reliability for direct precision handling characteristics. Available in a variety of different anodized colors for the ultimate choice in dress-up style. Get this and all your JDM at RHDJapan! !